Col du Sac is Open? 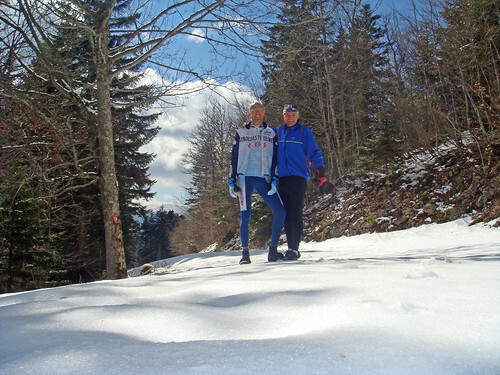 You are at:Home»France»Col du Sac is Open? 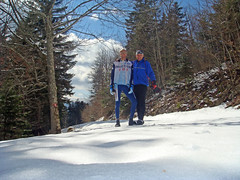 At the turn, I told Eric it would be impossible to reach and totally covered in snow. He gave me a half-smile. I knew we were going up. 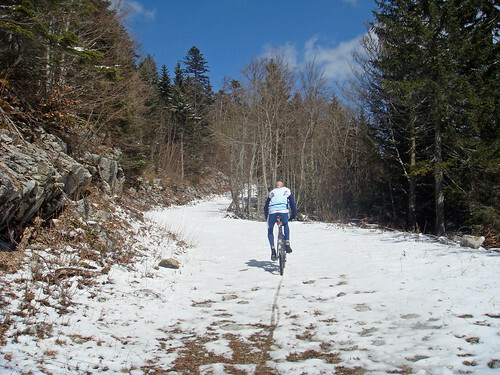 Col du Sac is open, if you don’t mind pushing your bike and hiking up through the snow. The plan was to cycle up to Tiocan, a nice little climb of several kilometres to 860 metres. Le Tiocan is a lookout over Lake Geneva, in the Jura mountains above Thoiry. At Tiocan though, we eyed a little forest road going up and decided to follow it. A beautiful deserted path that just kept going higher. 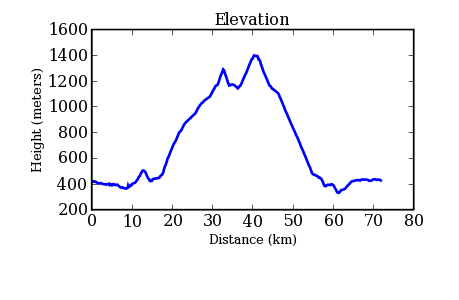 At one point we turned up and reached 1295 metres (4300 feet) after pushing through the snow before the route ended and we had to descend (the 1st bump in the elevation chart). 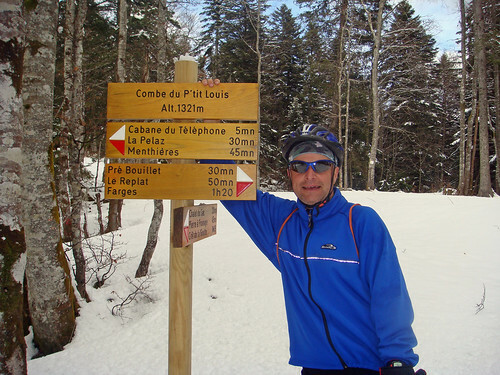 So we returned to the main path until we came to a road I recognized – the route to Col du Sac. I told Eric it would be impossible to reach and totally covered in snow. And he gave me a half-smile. I knew we were going up. It was such a beautiful day. Riding up through the snow is HARD and we often fell off and had to push. 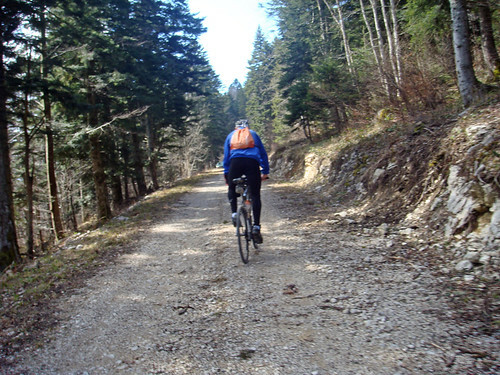 When we reached the tiny parking lot at about 1200 metres, we decided to leave the bikes and hike. Crazy friends lead to great adventures, and after 45 minutes or so, we came out to Alp-like mountain views and the Col du Sac. Woohooo. In the woods up high, we saw a huge wild boar crossing the road. Yikes! At this point we had been going for over four hours and the 1000 metre descent (requiring pedaling on the snow parts) was scarily freezing. Down below, as we returned to Geneva, it was like a different world – green and warm. Below: Col du Sac. Don’t ask me why we hiked the last kilometres with our bike helmets on. Will, have you seen how close the road coming up from Menthieres on the other side gets to where we were? I’m sure that the hiking sign to Menthieres would take us there in no time. Definitely something worth trying when the col opens a little bit more. If you look on the satellite map you can see the connection. Why did we hike up with our helmets? Good question and it made me think that we would never have left them on if we had been in a “civilized” spot. But up there, who cares? Nature is beautiful and that is what really counts. Katy sure had a good laugh about the idea that we hiked up the last part like that. Thanks again for yet another great ride/hike. Bravo on the adventurous trip! I’ll leave you die-hard cyclists to brave the chilly winds and snow-covered paths while I read and hear of your escapades from the comforts of home. Fantastic… What a ride/hike! You encourage me to find more adventurous routes around my home. But my area is no where near as exciting. Great post.